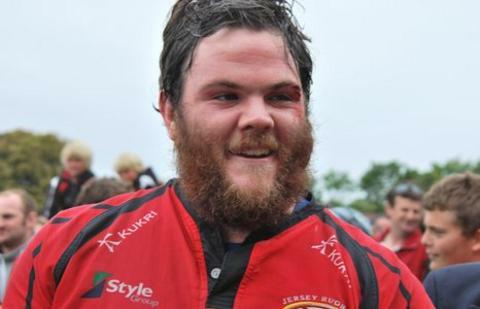 Jersey forwards Paul Rodgers and Jon Brennan have both been ruled out for the rest of the season after suffering knee injuries. Second row Rodgers, who is the club captain, has had an operation while prop forward Brennan is due to have surgery next week. Boss Ben Harvey says he does not have the budget to bring in replacements. "We do have enough cover, but we have not got a bottomless pit of money," Harvey told BBC South West. "Hopefully the injuries will have no impact at all on the side," Harvey added as Jersey prepare for their top-of-the-table clash with National One leaders Ealing on Saturday. New-Zealand born Rodgers played eight games for Jersey this season before being injured in the win at Stourbridge and led the island side to promotion from National Two South last season. Brennan is one of Jersey's longest-serving players, having been with the side since they were in the old London Division Three South West.